The ladies always smile at these samples at trade shows. We did this project at our family reunion, some ladies resisted but in the end loved the final look and decided to keep and wear them! The looped fringe is made from crochet string from the hobby store. This string is available in about thirty colors. The same type of string was used to make the curtain valance and tie backs (found in Home Dec) as well as several tassels (click on Tassels). You can view photos of these other projects in this Gallery. NOTE: Since we completed this project, I discovered, Flip Flop Glue, at Wal-Mart it is the best glue to adhering to the plastic straps. Place rods close together in the unit. Wind on enough string to cover as much strap as you want to cover. Remove unit with rods and go to the sewing machine. Slip one rod under the presser foot and place presser foot between the rods and sew down the middle several times to make your header. Once sewn several times - remove whole rod unit from under the presser foot and take to table. Experiment with glues that will stick to this plastic-vinyl not all glues hold well on this. We applied several different glues until we were satisfied with the holding power. Let the glue tack up. 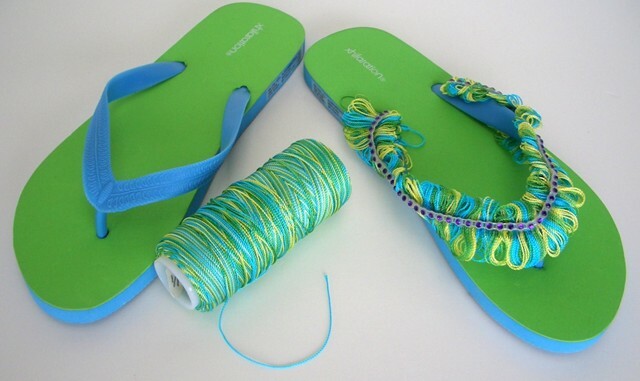 Remove rods from the arms and gently remove the fringe off the rods and place it onto the tacky glued sandal. We placed wax paper rectangles over the fringe every few inches and placed clip clothes pins over the wax paper to give the glue and fringe better tacking points. Let dry thoroughly, At least over night. After the glue dried we added the plastic beaded jewels, purchased by the yard. This fun project would be a neat sleep over project for older girls or bridal party project. How about decorating sandals in school colors what an adorable fund raiser. Summer camp project, 4H or just for yourself. To purchase our awesome fringe and tassel maker, click ADD TO CART.